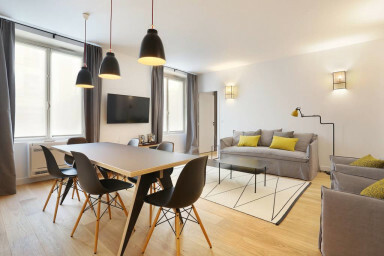 Pick A Flat is one of the leaders in short term rentals in Paris. We are always available by phone or chat for our guests, but we also prefer to allow them to directly access to the apartment by themselves at anytime they want. We provide a very complete house manual, and our quality control team along with our cleaning team put a lot of efforts into providing you the best experience possible! The apartment, rue Corneille, is located in one of the most beautiful areas of Paris, across the street from the historical Odéon-Théâtre de l'Europe and a short walk from the Sénat and the magnificent Jardins de Luxembourg.